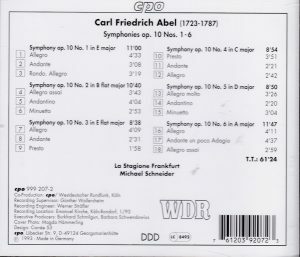 Carl Friedrich Abel’s dates – 1723-1787 – place him chronologically between Gluck (1714-1787) and Carl Philip Emmanuel Bach (1714-1788) on the one hand, and Haydn on the other (1732-1809). Other composers of note born in that decade or two are Wagenseil (1715-1777), the famous founder of the “Mannheim School” Stamitz the father (1717-1757), Leopold Mozart (1719-1787), Cannabich (1731-1798), Dusek (1731-1799). And, sure, Abel’s Symphonies op. 10 from 1771 sound very much like what you expect from composers of that generation and place (Vienna and Germany) – very much like Haydn in fact, and, it seems to me, not always vastly inferior in quality to many a symphony of Haydn, although aficionados more cognizant of the symphonies of Haydn might justifiably take me to task on that assertion. Anyway, there is a sweep, a “joie de vivre” to the Allegros, especially when played with as much enthusiasm as by La Stagione and Michael Schneider. 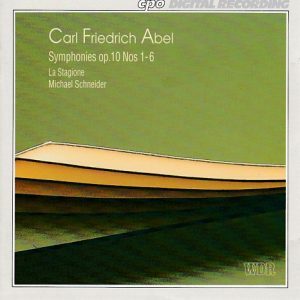 I don’t find Abel’s Andantes as distinctive, though (and they are NOT romantic adagios, mind you, and Schneider is commendable for not trying to change them into such), they are more embedded in a galant and salon style of the era, except the one of Symphony No. 4, which develops a fine, mourning mood, and 6, solemn and brooding. To be sure, this is music for entertainment. When he finally settled to London in the late 1750s and established the famous Bach-Abel Concerts in the mid-1760s (that’s Johann-Christian, Bach’s 11th son; Abel had been a pupil of Johann-Sebastian in Leipzig, and his father Christian Ferdinand Abel was the successor of Bach as Kapellmeister of Köthen when Bach was appointed in Leipzig), Abel acted as a private entrepreneur seeking to make a profit. He was happy to offer the public what it demanded. Objectiver met: the Symphonies op. 10 may offer no revelation, but they are very entertaining, and offer a fine if momentary diversion from your daily diet of Haydn and Mozart.